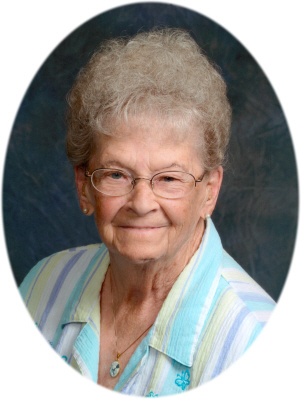 Margaret Louise "Margie" Chick, age 88 of Maple Rapids, MI, passed away Monday, March 25, 2019 surrounded by her loving family at Sparrow Hospital, Lansing, MI. Funeral Services will be held at Maple Rapids Congregational Christian Church on Saturday, March 30, 2019 at 11:00 A.M., with Pastor Jerry Kissling officiating. Visitation will be held on Friday, March 29, 2019 from 2-8 P.M. with family present from 2-4 & 6-8 P.M. at Smith Family Funeral Homes - Osgood Chapel, St. Johns, MI and for one hour prior to the service at the church on Saturday from 10-11 A.M.
Margaret was born in Maple Rapids, MI on June 15, 1930 the daughter of Charles and Florence (Tyler) Henry. She was a graduate of Maple Rapids High School and resided all of her life in Maple Rapids. Margie worked as a Paraprofessional with Fulton Schools. She loved birds and flowers. But her family was the most important to her. Margie loved to watch her children and grandchildren play sports. She also enjoyed crocheting and watching television, and she enjoyed cooking and baking; especially with her children. Margie was an avid Tigers fan and enjoyed watching NASCAR. Margie attended Maple Rapids Congregational Christian Church. She is survived by children: Linda and Ron Holder of Maple Rapids, MI; Connie and Terry Maniez of St. Johns, MI; Janet MacLennan and Mike Erickson of Ashley, MI; Ruth Ann Skea of Maple Rapids, MI; Carolyn and Gary VanDuinen of Houghton Lake, MI; Lyle "Butch" Chick and Barb Smith of Maple Rapids, MI; Pam and Marlin Miller of Maple Rapids, MI. Margie is also survived by 22 grandchildren, many great-grandchildren and great-great-grandchildren and several nieces and nephews. She was preceded in death by her parents Charles Henry and Florence Hulbert and 2 brothers: Cecil and Kenneth Henry. In lieu of flowers memorials may be made to the Maple Rapids Congregational Christian Church. Online condolences can be sent to www.smithfamilyfuneralhomes.com. The family is being served by Smith Family Funeral Homes - Osgood Chapel, St. Johns, MI.